French horror finds three troublesome youths Victor, Tom and Dan (Théo Fernandez, Zacharie Chasseriaud and Damien Ferdel) playing hooky from school and sneaking onto an abandoned movie lot. There they find a woman bound and gagged in an abandoned car who is sequestered away before they can decide what to do. 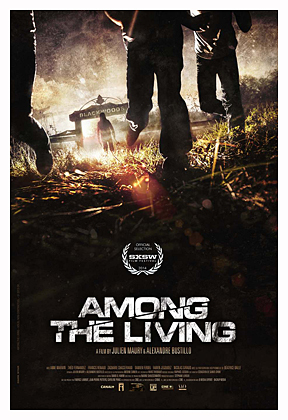 The police don’t believe them due to their reputations, but the man responsible, deranged war veteran Issac (Francis Renaud) isn’t taking any chances and sends his deformed son Klarence (Fabien Jegoudez) to kill the three boys and their families. Flick is written and directed by Julien Maury and Alexandre Bustillo, the duo the brought us Inside, Livide and the recent Leatherface. It combines a youth coming of age story with a Texas Chainsaw Massacre slant as these deranged individuals plan to kidnap women to expand their family…which is introduced to us in the gruesome opening…and murder any witnesses. There is some vicious and brutal violence and some very disturbing moments and the makers aren’t afraid to do more than just put the three boys in harm’s way. The deranged Issac is a war veteran whose been effected by chemical warfare and thus it has led to Klarence being born deformed and being a bit unhinged himself. That being said, this really isn’t anything new. Changing the location from an abandoned slaughter house to an abandoned movie studio isn’t much of a change and innocents being stalked and murdered by deranged and deformed individuals has been a horror standard for decades. It’s effectively done and thus is still disturbing and the cast all play their parts well. It’s an effective thriller even though it combines story elements that have been told time and time again. In conclusion this is a brutal thriller, though nothing innovative or new. It uses a combination of popular movie tropes and adds some very graphic violence and isn’t afraid to unleash that violence on any of the cast members. 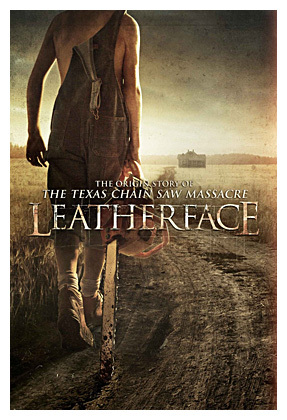 It’s easy to see why the duo was chosen for the prequel Leatherface, though that was nothing new as well. An effective if not derivative thriller. Rated 3 (out of 4) naughty lads who should have played somewhere else. 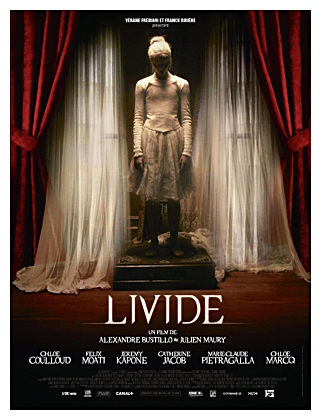 French horror tells the story of a young woman named Lucie (Chloé Coulloud) who is studying to be a home care nurse. On her first day, she learns that one of her future patients, a comatose old woman named Mrs. Jessel (Marie-Claude Pietragalla), is rumored to have some kind of hidden treasure in her creepy old house. Lucie tells her boyfriend William (Félix Moati), who sees possible riches as a way out of their small coastal fishing village. They break into the house one night, along with their friend Ben (Jérémy Kapone), but soon find themselves locked in and that the house and it’s occupant have a nightmarish secret. Flick is written and directed by Julien Maury and Alexandre Bustillo, the French duo who brought us the bonkers chiller Inside and the recent Leatherface. It starts out as a sort of haunted house thriller, but then evolves into something else as we find out what really inhabits the Jessel home. There are some very spooky visuals as the duo use the creepy old house setting very well. There is also some of their trademarked graphic violence and the film has an unsettling atmosphere, especially once our three protagonists get inside the house. The flick is held back by a narrative that doesn’t always make sense, but does weave in some dark fairy tale elements, especially in the last act. The film also has moments that evoke Guillermo del Toro’s Cronos and even if we are scratching our heads a bit by the time the credits roll, there was enough to chill and entertain and maybe gross us out a little bit. The cast are good with lead Chloé Coulloud making a strong heroine in student nurse turned reluctant thief, Lucie. She seems like a sweet girl and has issues of her own that motivate her and even affect her actions when she meets the occupants of the old house. Félix Moati is fine as her fisherman boyfriend, who dreams of a better life. He’s not an outright bad guy, just someone who is willing to cross lines to get out of his small town. Jérémy Kapone is also solid as Ben, a friend of the couple and another reluctant participant in the events. He is more likable than William. Marie-Claude Pietragalla is suitably creepy as Mrs. Jessel in both flashbacks to her days as a cruel dance instructor and to the old woman she is now. Rounding out is Catherine Jacob who is the home care specialist with a secret who is training Lucie and Chloé Marcq as Jessel’s daughter, who we are told is long gone and is seen in flashbacks when we start to get some backstory. After the shocking Inside, Julien Maury and Alexandre Bustillo followed it up with a spooky flick that has some chilling moments, but also suffers from being a bit too ambiguous at times. It may leave us with a quite a few questions once it’s all over, but has enough chills and unsettling sequences to entertain us well enough. Not as memorable as Inside, but shows the French duo have some interesting ideas, some unique twists on familiar tropes and a solid visual style to accompany the chills and gore. WARNING! : the Livide trailer gives away some substantial spoilers!